The subatomic world of nature at its essentially reduced smallest dimension is comprised of localized packets of energy best shown as waves comprised of a variety of wavelengths. We can now plainly see that in order to maintain constancy in the above equation, that as the composite variety of wave lengths for a mass - particle becomes overall shorter, the overall composite magnitude of the variety of momenta must become greater. where the shorter the wavelength of the mass - particle, the higher will be its frequency and hence carry a greater amount of energy which translates into a larger amount of momentum. That is, as composite wave length becomes shorter, all of the composite characteristics of the wave - particle ( frequency, energy and hence momentum ) will gain unit magnitudes in their respective probability distributions. And the opposite will also be true as well; that is, as the composite wave length of a wave - particle becomes longer, therefore the other composite characteristics of frequency, energy and momentum will also all decline in their respective unit magnitudes and will do so as a probabilistic distribution. Hence, whenever position of a mass - particle of wavelength is more accurately determined owing to a given opening in a wave - diffraction experiment, the less accurate will momentum be determined. And, the opposite is also true: namely, that as momentum of a mass - particle of wavelength is more accurately pre-determined, the exact location position will be less accurately identified in any wave - diffraction experiment. 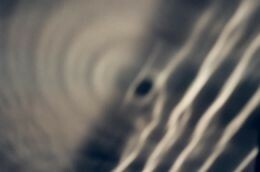 we also discover a probability pattern of strikes or "spreading out" ( distribution of intensity ) on an observation screen of this wave diffraction phenomenon for the mass - particle. Hence the uncertainties in either the location and/or the momentum of a mass - particle in terms of its wave function at any given instant must be at least equal to or greater than , Planck's Constant. Therefore, if for example we attempt to "pin down" or locate a mass - particle, Heisenberg's calculation will give us higher and higher velocities ( remember: momentum = mass x velocity ) for more and more precise locations. On the other hand, if we somehow slow down the mass - particle or even achieve a precise velocity ( or momentum ) for the mass - particle, the location "spreads out" and becomes fuzzy and hence probabilistic! Oh, also notice that Heisenberg's Uncertainty Principle has absolutely nothing to do with any interference with the mass - particle by the observer's measurement technique or instruments involved. It rather solely pertains to nature's inherent wave function for sub-atomic mass - particles and from which . 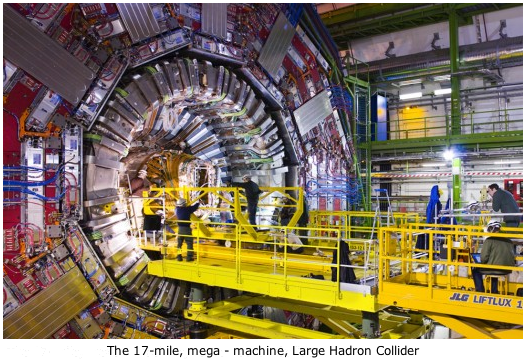 § Case 2a: Suppose that the smashing of protons at the speed of light does actually occur but only for a time duration of with a 1% precision in time measurement. 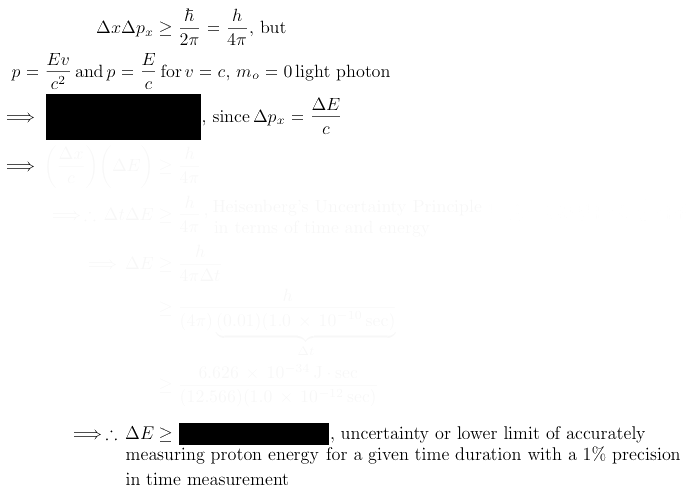 The amount of time that it would take to make this energy measurement to a precision of 1% is found similarly as before.  ∗note: some of these examples are used in the future upcoming Relativity Physics and Science Calculator Mac application for Heisenberg Uncertainty Principle. "Can Quantum-Mechanical Description of Physical Reality Be Considered Complete? ", by A. Einstein, B. Podolsky, and N. Rosen, Institute for Advanced Study, Princeton, Physical Review, Vol. 47, May 15, 1935. This is a seminal paper in the history of quantum physics and Heisenberg's Uncertainty Principle. "The Particle Problem in the General Theory of Relativity", by A. Einstein and N. Rosen, Institute for Advanced Study, Princeton, Physical Review, Vol. 48, July 1, 1935. Seminal companion to the May 15th published paper in the history of quantum physics and Heisenberg's Uncertainty Principle. 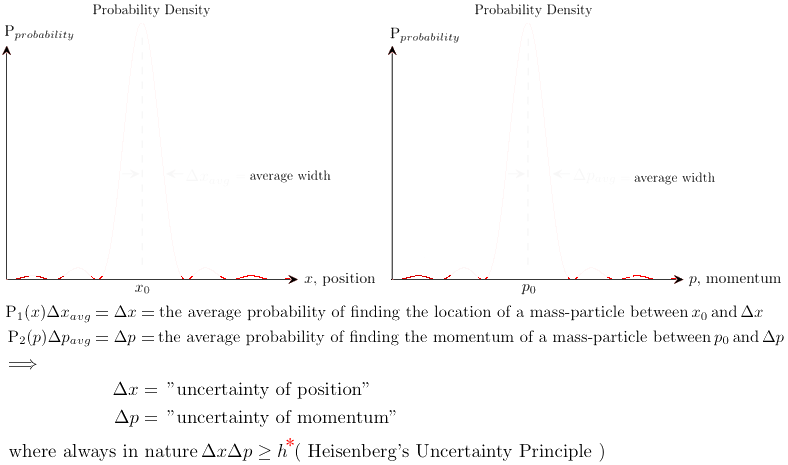 "Equivalence of wave-particle duality to entropic uncertainty", by Patrick J. Coles, Jędrzej Kaniewski, and Stephanie Wehner, published September 16, 2014, The Center for Quantum Technologies, National University of Singapore, Singapore, all of whose mathematical modeling conceptually combines Heisenberg's Uncertainty Principle with the Quantum duality of the wave - particle heuristic in addition to mathematically unifying 'wave' with 'particle' concepts. "Simultaneous observation of the quantization and the interference pattern of a plasmonic near - field", by L. Piazza, et al., published March 2, 2015, setting forth a unique experiment making imagery, simultaneously, of the quantum wave and particle characteristics of light photons. "Does the ψ-epistemic view solve the measurement problem? ", by Shan Gao, Institute for the History of Natural Sciences, Chinese Academy of Sciences, September 6, 2015. In the problem of measuring features of a quantum ψ-wave function, do the pre-existing eigenvalues of the collapsing wave represent an updated amount of epistemic data of an underlying final reality and should therefore be accepted, then-and-there, at face value? And with that the quantum wave "measurement problem" is therefore solved? Or, should a deeper ψ-ontological ( -ontic ) model of reality be pursued to better encompass an admittedly rather superficial and constantly changing ( updating ) ψ-epistemic model? But, still, is the ψ-ontic model itself a lost fool's errand otherwise according to Heisenberg's 'Uncertainty Principle'? Thus in the physics quest for quantum reality, it therefore becomes in a final analysis a philosophic quest for ultimate reality.